“Glory Hounds” was filmed in Afghanistan, where it tracks four servicemen and their explosives- and insurgent-detecting dogs on combat missions. As Marine Lance Cpl. Kent Ferrell says, while his German shepherd Zora waits nearby, “there are those who consider our military working dogs to be pieces of gear.” But no one in this film thinks that way. 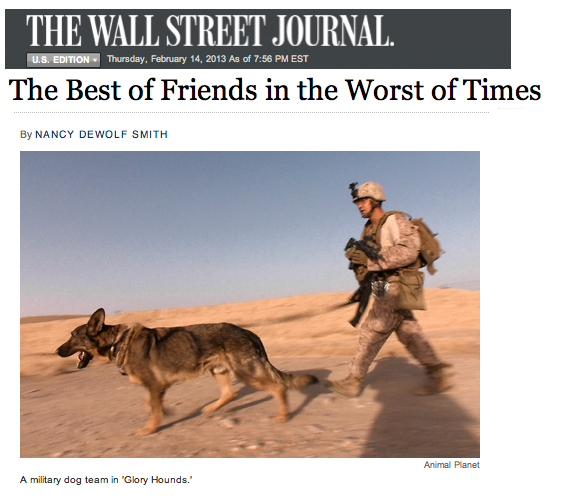 To their service partners, the dogs may be beloved friends, but to all they are fellow warriors, valued and respected for their lifesaving role. Most of the film was shot in the southern provinces of Kandahar and Helmand, the cradle of the Taliban and the region responsible today for two-thirds of all U.S. and other coalition casualties. Lance Cpl. Ferrell and Zora, for instance, are stationed at the patrol base Barioli, an isolated outpost in a dry sea of Taliban territory. Some of the locals are friendly, even helpful. But when Zora signals that she has detected explosives in a locked chest in one villager’s house, there are grim faces all around and time stands still for us too. Even worse in terms of tension are the patrols where the dogs are responsible for finding buried IEDs—improvised explosive devices—that the Taliban can make with fertilizer and the carbon rods inside ordinary batteries. The first time we see such a patrol, with the dog on a leash that looks about 25 feet long, the seriousness of the animal’s predicament hits home. “We will find what you fear” says a base poster outside its K-9 kennels. And we will die so you do not have to, is what it means. Not all of the dogs are German shepherds, nor do they have identical skills. Lance Cpl. Durward Shaw works with an attack-trained and explosives-tracking shepherd mix named Falko. Cpl. Drew Nyman patrols with Emily, a Belgian Malinois shepherd deployed to sniff out insurgent humans in their hidey holes. Air Force Staff Sgt. Len Anderson is training with the experienced bomb-detector Azza, another Malinois. Yet the dogs do seem to be overwhelmingly female. Perhaps this is because, as handlers of demining dogs have observed over the years, the females tend to be much more slow and cautious in the field. They are right to be, because their skills make them special targets of the Taliban. “You’re not supposed to fall in love with your dog” one of the handlers says here, “but you’re going to.” So when shots ring out, explosions erupt or a Taliban grenade goes off, the usual worry is compounded. As painful as it is to see a fallen dog’s body draped in the American flag, what “Glory Dogs” also does is deepen our appreciation for the servicemen who train them. So young, so far from home—missing a child they have never seen, or celebrating a 21st birthday without knowing if there will be another—they seem both larger and smaller than life. One of the men will return home with grave injuries. So grave that when he is reunited in the U.S. with his dog, he has only a few fingers left with which to stroke her. It is more than enough.